Spring is here (almost), and for many people that means it’s time to get serious about the garden. Not my family, sadly, as we live on a corner lot so we have a teensy heavily shaded yard. But two lucky readers are going to win the Premium All-In-One Micro Sprinkler Kit to help them make their gardens glorious! 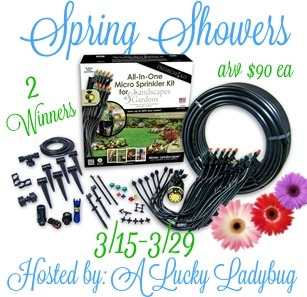 This Premium All-In-One Micro Sprinkler Kit can water up to 535 sq ft of landscapes, gardens, shrubs trees and more! This giveaway is open to the Continental US only (because of shipping costs) and will end on March 29th, 2016. Good Luck!! I’m planning on planting a flower garden so the landscape/shrub one would be great! I liek the Premium all in one kit this would be great for my garden.. I would choose the Vegetable Garden Drip Kit. Since I’m new at this, it would be the Micro Sprinkler beginner kit. I think the Vegetable Garden Drip Kit would be great, especially since you can add to it. The one that would be best for my yard is the landscape and shrubs.